Everybody knows that there are gifted people for everything, ok, but what not all know is that a pack of them flock together in 4º B-C bilingual this year and every now and then they give us some bits of their talent. Why do you look so sad, my darling? Doesn’t the light shine where you are? Doesn’t the girl listen to you anymore? Why do you hurt yourself, my darling? Does nobody believe in you anymore? Why did you leave me, my darling? Did her lies become too much? Where’s the limit? What’s the next challenge? Time, Space, Intelligence…? After reading a passage of H.G. 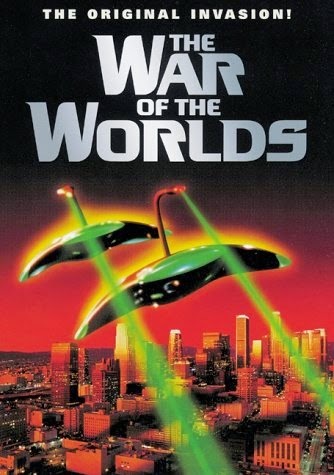 Wells’ “War of the worlds” in class, I made a proposal: “Why don’t you make some teams to write a short four-or-six-hand sci-fi tale?” That was the challenge and they accepted! When I say “they” I refer to my class of 4ºESO B-C bilingual (the loudest class ever but the one you can’t help loving). They had one week to squeeze their brains, loose their imagination, work effectively in teams and to give birth a short tale… and so they did! I had promised them to have a winner but I can’t! you can take my word for this; so I have decided to ask them for permission to upload the tales to our magazine and let the readers decide. I have uploaded the three first stories but I will upload them all as the students send them to me. Hope you can enjoy the tales as much as I did. Just click the page “THE TALES” above to ckeck it out and please, We will open a poll gadget next Dec.19th for the readers to vote; we hope that all the writers will have handed their masterpieces in by then. It started on the 23th of March. We had 4 days ahead. The plane to London took off at 7:30 in the morning, so we left Torrijos at 4:15 am so it was still dark . We were really sleepy in the bus which drove us to Madrid, but we resisted and nobody fell asleep. When we reached the airport, we were wishing that the time of the take-off arrived. Fortunately we all passed through the police control without any problem. 7:00 stroke at last, boarding time. At 7:30 we were already flying. After two hours, the long-awaited moment arrived: WE WERE ALREADY IN LONDON! After passing another control at the customs and walking through Gatwick airport, we went out to the street and took the bus which picked us up to the hotel. From the bus we could see a preview of what we were going to see later. When we arrived at the hotel, everything started to go wrong. Everything was like a joke; no one expected what was going to happen. The room reservation of the girls had been mistakenly cancelled by the travel agent. In that situation, we´d better taking it like a joke… Fortunately, after being waiting at the hotel´s hall for a long time the problem was solved. The first day we were tired, but the fatigue didn´t prevent us from starting seeing things and having a good time. We reached the hotel around 6 in the evening, but before going up to our rooms, we went to a nearby supermarket. And as usual, we got noticed along the street. That night we went early to sleep, but before this we had been together in one of the rooms but we behaved well. The next day was the best day of our trip. Despite getting up early, we resisted all day like the champions we are. That day everyone was staring at us, because we were shouting and singing like crazy people all along the streets. We visited some museums and other landmarks in London. The night was the best part of the day. We slept seven people in three beds; we couldn´t move and we didn´t stop laughing all night. The third day we visited some of the most famous landmarks of London. 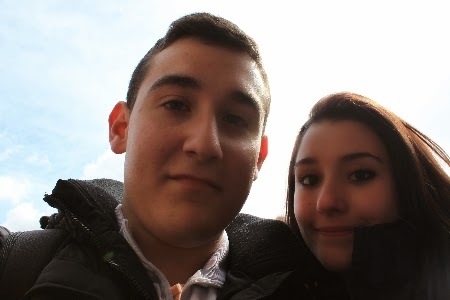 That day we met two girls and one boy who were English and with whom we were talking and having some good fun. The fourth day we went to Oxford (thanks to the man at the station because if not we couldn´t have gone). That day everything was wrong with us: the queue for having breakfast was never-ending, the queue to get the tickets for the underground was stuck, we got lost at the underground, we missed the train to Oxford… When we finally reached the train station, Luis and Angela got other tickets to go to Oxford. After all these problems, we arrived in Oxford! Oxford was a beautiful city; the best thing at the city was Christ Church College where Harry Potter was filmed. That night was the last night, everyone was sad and anyone wanted to return. The next day, we had some surprises for Luis and Angela, to thank them everything. But it wasn´t the only surprise. When we were at the hall, ready for leaving the hotel; a reception guy told one of the professors that some students had been throwing things out through window. These students had to collect what they had dropped and to disguise they told us that they were going to buy bread. Unfortunately, the unwanted moment arrived. The bus was waiting for us, we had to go. Leaving the sadness aside, at the bus we were remembering the best moments of the trip. We reached the airport. The flight back home was coming closer. We took the last pictures. The plane took off again. After two hours we were back in Spain. Our faces showed fatigue, sadness and desire to be still in London. When we reached Torrijos, our parents, brothers, sisters and dogs were waiting for us. We said goodbye and everything ended. The following days we were under the effects of the post-trip depression and today, after two months, everybody continues remembering special moments and with a lot of desires of returning. Thanks to everyone for making this the best experience of our lives! We have made good friends and also we had met great people. 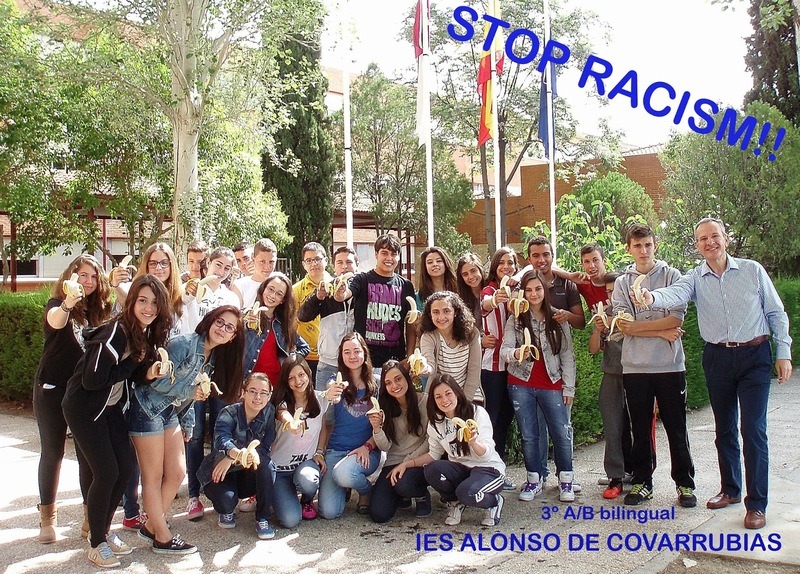 3º A-B bilingual says STOP RACISM!! Students of 3º AB bilingual had a nice proposal after the unspeakable behabiour of some Villarreal FC supporters in their match versus FC Barcelona, when one of its players, Dani Alves, received racist insults and was booed while he was thown a banana as if he were a monkey. Dani Alves’ reaction was great, he peeled the fuit and ate it in front of the confused open-mouthed racist supporters. Great, great Alves! Social networks started to boil and thousands have been the people who joined to one shout: STOP RACISM! Students decided to bring a banana to school, peel it and eat it to show their affection and solidarity to Dani Alves. Let’s hope this kind of intiatives start blooming everywhere. 1.How old were you when you started practicing dancing? 2.Why did you start doing this? 3.What was your best achievement in dancing? 4.How many hours do you spend practicing dancing? Do you have enough left time to do your homework, meet your friends…? 5.Do you have friends from other clubs? 6.Would you like to continue practicing dancing in the future? In a professional way or as a hobby? 7.What are your feelings when you’re only seconds away from starting? 8.What do you feel when you win? And also when something is not as you expected? 9.What are your main goals for this season? 10.What is your favorite style in this discipline? 2.Because we was very flexible and this sport was very entertaining for us. 5.Yes, in general all our partners and we have a lot of friends from other clubs as we coincide in many competitions. 6.Yes, we would like to continue practising dancing in the future but just as a hobby because it is a sport that requires a lot of ascipline and dedication , and it is not rewarded as it should be. 7.We feel very nervous but at the same time we want to show everything we do and all the work that we have put on this. 8.When we win a competition we feel satisfied because we know we have been working for a long time to do our best,and when something is not as we expected , it is useful for us to improve the exercise for the next time. 9.Our objective for this season is to get a place in the Spanish competition, in the absolute category. 10.Our favourite style is the individual, with hoop, that is my favourite apparatus. 1.I started when I was 4 years old. 2.Because I was always dancing in my house and my mother took me to ballet clases. 3.When I won some competitions. 4.I practise sixteen hours per week. 5.Yes I have enough time. 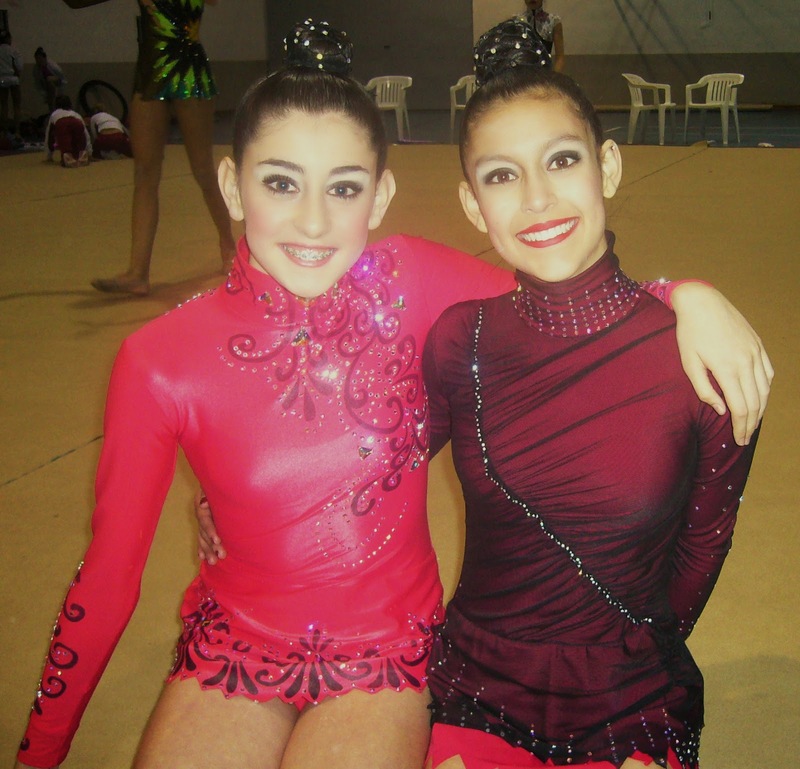 7.I want to continue dancing for ever,and also I want to dance in a profesional way. 8.I feel nervous but at the same time I want to do my best so I breath and go on. 9.When I win a price I am the happiest person in the world , but if the competition hasn´t been good I cry but I learn about it. 10. I improve a lot.